Best Dog Training Denver Southeast! Welcome To Bark Busters Home Dog Training of Southeast Denver. As a Bark Busters behavioral therapist and trainer, I will work with you to solve the issues you are experiencing with your dog. We can train any dog, any age, any problem - even yours! 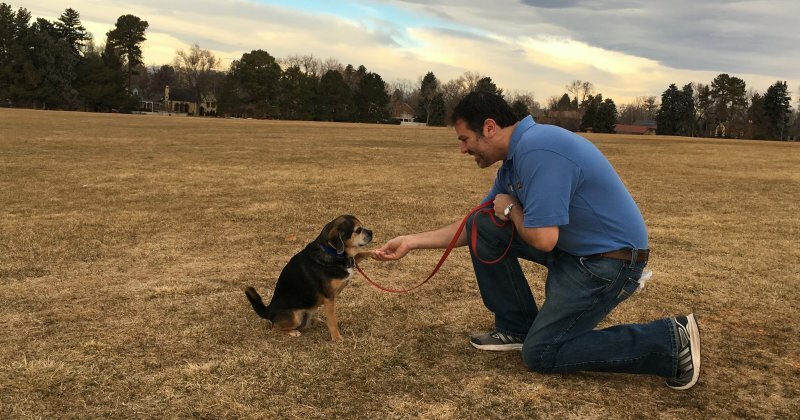 I have been with Bark Busters for over 9 years and have trained hundreds of dogs in the Denver area and have earned the highest designation within the Bark Busters Dog Training system. My territory includes Parker, Centennial, Littleton, Elizabeth, Englewood, Franktown, Sedalia, Larkspur, Bennett, Kiowa, and Elbert. FED UP WITH YOUR DOG'S BEHAVIOR PROBLEMS? Are you irritated, frustrated, angry, or even desperate when dealing with your dog's inappropriate embarrassing or even destructive behaviors? Don't worry any longer; you have come to the right place: Bark Busters of Southeast Denver. Dog behavioral problems like excessive barking, jumping up, aggression to people and other dogs, digging, marking, chewing, sibling rivalry and separation anxiety are only a few of the behavioral issues that we, as dog trainers and behavioral therapists, can help you begin to conquer in the first few hours of us working together. Bark Busters' training methods are pain-free, and are designed to address your dog's temperament and your goals for training. Each one of our lesson plans are written with your participation and objectives in mind. No "one size fits all" here! Our individualized approach is the best system for re-training "problem" dogs or for starting your puppy out on the right track. We will teach you a method of communication that your dog already understands, based on canine communication, body language, and the relationship dynamics within your household. You will learn how to use your body language and vocal communication to get your dog to focus on you and respond to your direction based on a relationship of mutual trust and respect. You will learn how to educate your dog on what behaviors are acceptable and which are not. Our methods are designed to enhance the emotional humane canine relationship developing a healthy balance of mutual trust, respect, and that loving connection we are all looking for with our canine companions. We come to your home at a time convenient for everyone in your household. Dogs learn more quickly, suffer less stress and are less distracted in their home environment. In the first lesson, you will begin to see improvements in your dog's behavior. The effectiveness and efficiency of Bark Busters of Southeast Denver and the easy to learn methods will become evident as you begin to change and eliminate unwanted behaviors. We assess your personal situation and will custom tailor our dog obedience training to allow you to become the authority in your relationship with your dog. Your dogs perception of you as the authority in your household will earn you the respect and trust to allow you to modify your dog's behaviors in a manner that suits you. Bark Busters believes so strongly in its methods that we offer Guaranteed Lifetime Support. If you choose our most popular "Life of the Dog" service plan which has helped over 1 million worldwide, we will return free of charge to work with you if any new behavioral issues arise or you just need a refresher course. Our commitment to your success give you the peace of mind of knowing you will have the help you need to resolve the issues in your dog's behavior that are causing you stress. When you call us we will help you choose the service level that will work for you to create the greatest value for your training budget.